Your Aunt is super special. She is always there to play around with, go to the movies and of course give the best presents. Show her how much she means to you by creating a Personalized Aunt Sweatshirt as thoughtful Personalized Aunt Gifts she will be oh so proud to wear. Your Custom Printed Aunt Shirt is available on our premium white cotton/poly blend Personalized Sweatshirt, machine washable in adult sizes S-3XL. Also available in Pink and Ash Gray. All Gifts for Aunts include FREE Personalization! 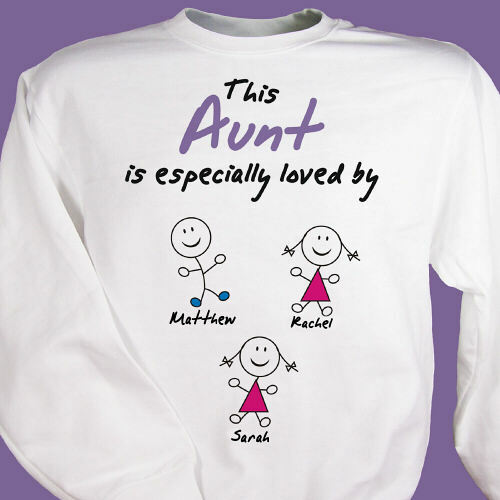 Personalize your Aunt Sweatshirt with any title like Aunt or Mom and up to 12 names. Please specify girl or boy. i.e. : Sam (b). GiftsForYouNow.com has many additional Personalized Aunt Gifts for your favorite Aunt. We specialize in attractive Personalized Gifts your Aunt is sure to love.